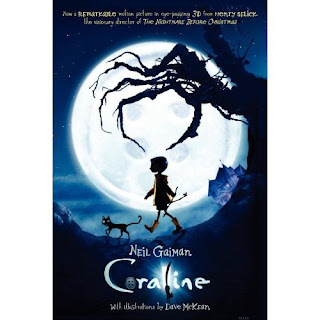 Before we (and by we I mean everyone in the entire world) fell in love with Neil Gaiman's The Graveyard Book, we (and again, I'm including the masses in this statement) loved Coraline, his creepy novella about a curious girl and her adventures in a world similar to her own. When she climbs through a locked passage on a boring rainy day, Coraline ends up in a parallel universe with an "Other Mother" who seems like a much improved doppleganger...that is, until she won't let Coraline leave. If that's not enough to chill your spine, everyone living in the other world has buttons for eyes. How creepy is that? Anyway, Coraline won the 2003 Hugo Award for Best Novella, the 2003 Nebula Award for Best Novella, and the 2002 Bram Stoker Award for Best Work for Young Readers. It has been turned into a graphic novel and last year the amazing stop-motion 3-D movie came out. It's rare that a movie can live up to a book, but this film captures Gaiman's flair for the fantastical with amazing attention to detail and beautiful visual effects. The movie is so much fun to watch, for both the plot and for the artistic touches. Plus, did I mention how creepy it is? 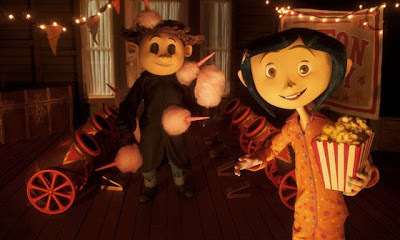 So since we (I'm not including anyone other than Little Shopsters in this statement) like to celebrate all holidays for weeks leading up to them, we're getting into the scary spirit -- a Halloween pre-game, if you will -- with a screening of Coraline here at the shop. Join us this Friday night, October 23rd at 7 pm. and we can munch popcorn together as we shriek and scream and oooh and ahhh. Hope to see you all here!